If there is one thing I miss from my fooding time in North Carolina when I was there for school, it is legitimate Southern barbecue. This area of cuisine is highly lacking in Orange County so upon first news of Lillie's Q coming to the community, I was ecstatic to see just how exactly it would be done. News came much earlier than the building and restaurant opening did but that only built up the anticipation. 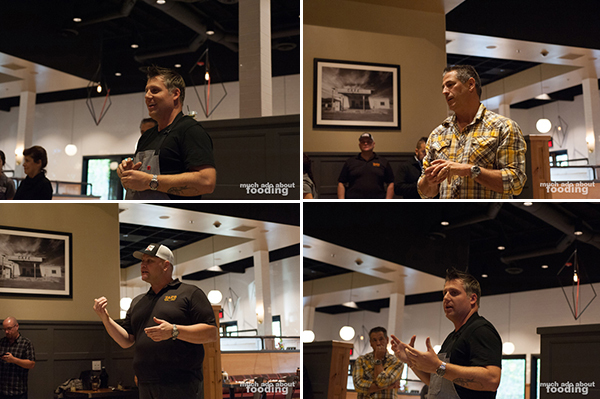 The powerful team of Joe Manzella (whom you may know as TAPS Fish House & Brewery owner) and Executive Chef Charlie McKenna planned to rock the OC world with authentic barbecue, and when the time came to open, Lillie's Q hosted a media tasting event much to our joy. Upon first bite of the actual barbecue, I was sold; this was what we needed to expose people to the beauties of legitimate Southern tender, juicy, and lovable barbecue. The 4,500 ft² space is not the first of Lillie's Q but it is the first in California. It was named after Executive Chef Charlie McKenna's grandmother Lillie (still alive today at a young 87!) who was his initial inspiration for cooking as she was the provider of biscuits and gravy, grits, and the whole gamut of South Carolinian cooking. The Q is a tribute to his father whose first initial is Q as well as to the focus of "BBQ." Chef Charlie learned the art of barbecuing from his father whom he helped during catering events since he was young, doing events up to 700 people with only his father alongside him, and whom competed with him around the world in barbecue competitions, winning a world championship in 2007. After going through a restaurant management program, learning at the CIA in New York, cooking fine dining at TRU in Chicago, and experiencing running a business through Lucky Strike, Chef Charlie was ready to take on the restaurant world. The first existence of Lillie's Q was a small shack in Florida on the beach, serving dishes on metal sheet trays. Fast forward to 2010 - a space was found for a second location but to make it more upscale dining, Charlie incorporated the same interior design as the Brea feel. Warm earth tones and an emphasis on wood filled up the space, and sauce squeeze bottles were replaced with classier-looking glass ones. 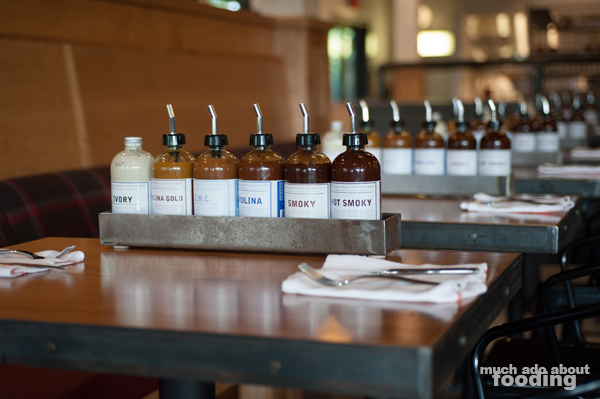 Food & Wine magazine named them the best barbecue in the country in 2010, and the sauces can be purchased in more than 1,000 retailers including Crate & Barrel and Whole Foods. Then with TAPS owner Joe interested in barbecue, it was time to raise up the concept in Orange County. The main focus of Lillie's Q is the barbecue made with upscale ingredients but in an environment where guests will have no worries about spending time together for a few hours. 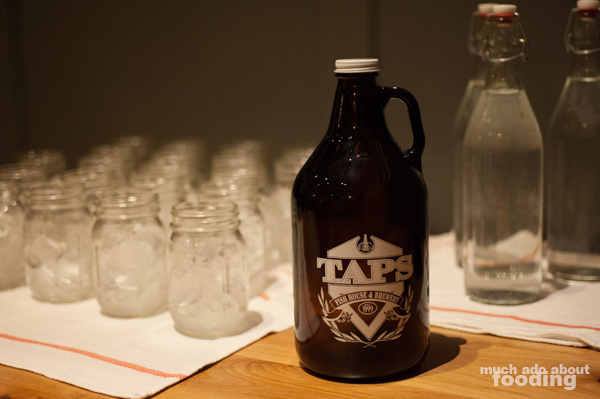 We were introduced that afternoon to the Hog-Tied Amber Ale which is TAPS' specially made beer for Lillie's Q, available year-round on tap and put together by brewmaster David Huls to pair beautiful with the barbecue. Delicate with amber malts and caramelized brown sugar notes, the amber ale was a clean way to drink alongside the rich, flavorful skill in the meats. 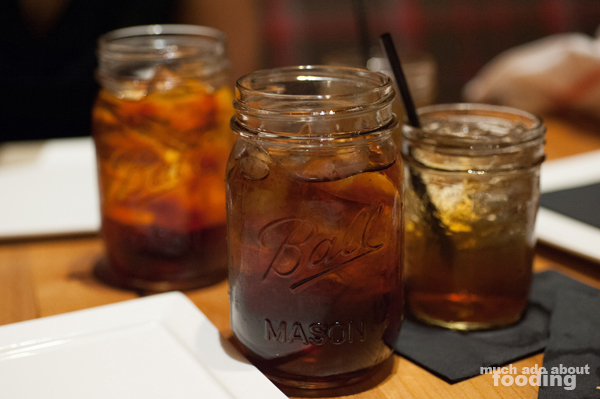 If beers are not your thing (and they're sourcing all American craft beers, mind you), then you should get in on the authentic Southern sweet tea they've also got! 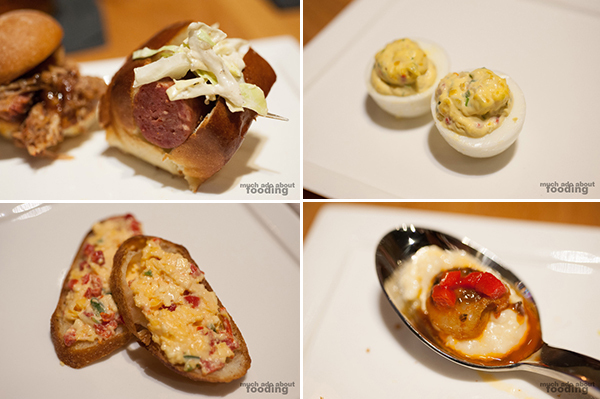 We all began with sampler sizes of their dishes which included the Hot-Link Sandwich ($8 - smoked hot link on a brioche bun), Smoked Deviled Eggs, Pimiento Cheese ($5 - Cheddar, pimientos, jalapenos), Shrimp & Grits ($18 - with Lillie's sauce), and Pork Rinds ($5 - with pimiento cheese powder). The deviled eggs were an easy crowd favorite for its texture and smokiness while the shrimp and grits blew away any other shrimp and grits dish I've ever had out here. Smooth and savory, the mouthful of shrimp and grits was beyond amazing. I could pick that for an entree daily. As the for the pimiento cheese, it could have been even creamier to better represent the Southern style but seeing as nowhere else offers it, I appreciate their inclusion of this Southern staple. Other starters included the Hush Puppies ($6 - corn, scallions, sweet potato dressing), Fried Pickles ($6 - pickles, beer batter, and Ranch dressing), and Pulled Pork Sandwich ($8 - BBQ pork on a brioche bun; Southern style +$1). 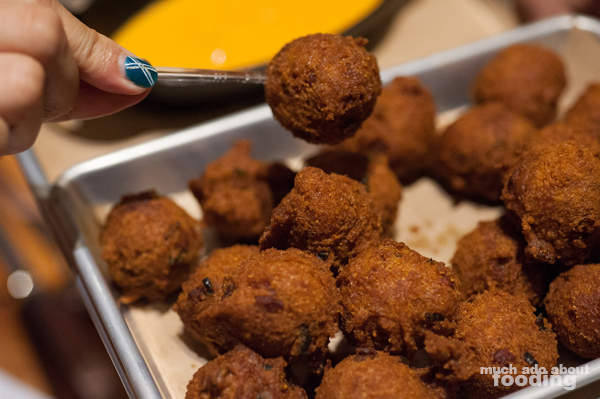 I felt like the hush puppies were too dense and slightly burnt that afternoon so would have to see it again another time. 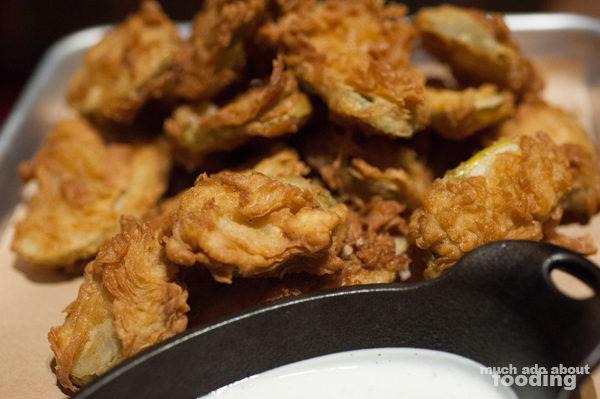 The fried pickles were sublime, coated in a batter reminiscent of a good fried chicken. As for the pulled pork, that is what we've been missing. 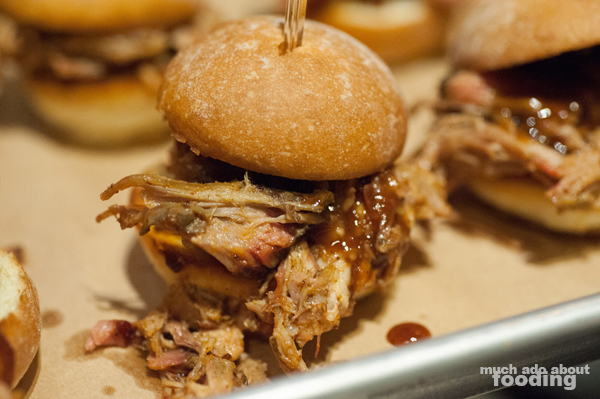 The pull-apart juiciness of pulled pork done right was overloading the slider buns. It was perfect. 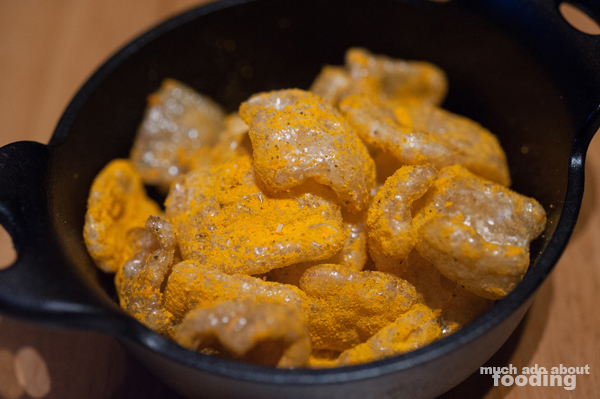 If you're curious about other dishes on the menu, they are mainly barbecue with the exception of a few "non-Q" things such as a Southern Caesar Salad using crawfish tails and biscuit croutons. Yum. Did we actually get to taste the barbecue though? 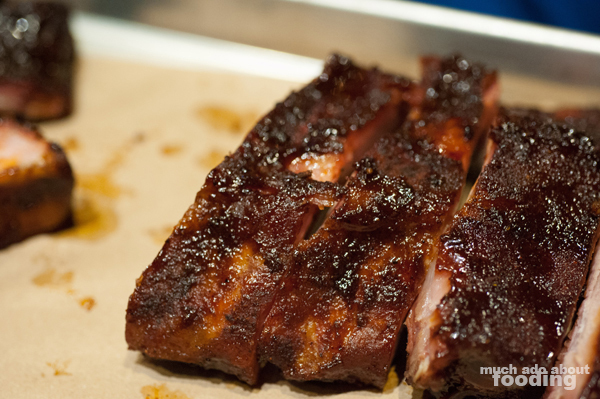 Absolutely - a taste of Chef Charlie's beautiful Baby Back Ribs ($15/$20 - with Carolina dirt and apple glaze) gave us enough of an impression to know that having Lillie's Q in Orange County is a blessing. Using peach wood as a tribute to the South Carolinian peaches and wood used in the chef's training, the in-house smoker produces tender meats with the light and slightly fragrant wood. The restaurant concept uses indigenous woods for each location so finding a nearby producer/farmer of peach wood was a priority prior to the Brea location's opening. Unlike other professional kitchens which go the easy way out with a gas smoker to manufacture the smoking, Lillie's Q goes the true route with a real smoker that runs from 225-275°F for four to five hours for each batch of meats. I'm interested in their future offering of the Whole Hog Dinner with eight starters and sides for feeding 6-8 people which requires a 48-hour notice for only $325. What a family gathering that will be. 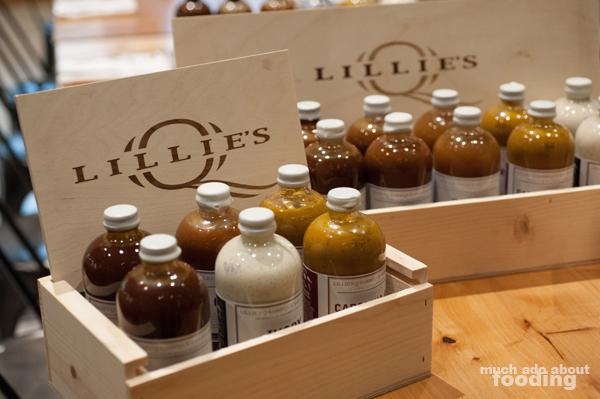 If you are into sauces, know that Lillie's Q sauces are all-natural with no preservatives nor GMO ingredients. Every one is available at the table so you can try them all out to see which one you like best. I was partial to the Carolina one myself. 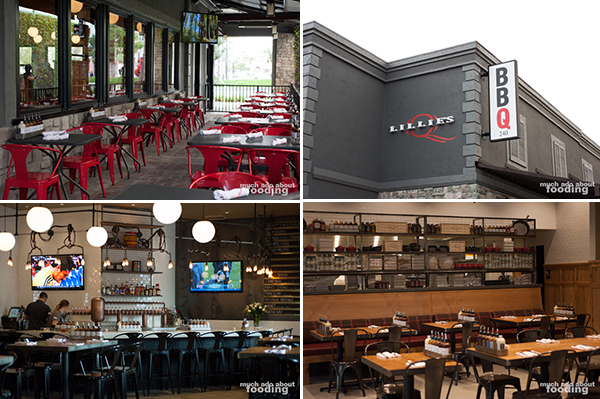 Find Lillie's Q at 240 South Brea Boulevard, Brea, CA 92821 and bring a hungry stomach. It's time for real barbecue to be tasted!